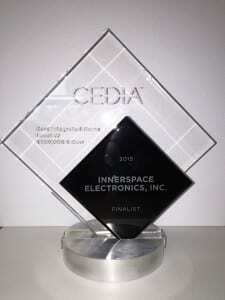 Westchester, Fairfield County & NYC, New York – November 3, 2015 – InnerSpace Electronics, Inc., New York’s leading resource for premium home technology solutions, is proud to announce that their award-winning Orange County, NY project has been recognized again this year, this time as a winner in the Best Integrated Home category of the 2015 CEDIA Electronic Lifestyles® Home Technology Professional Awards. The CEDIA Electronic Lifestyles Awards Program recognizes the best home technology projects designed and installed by CEDIA member home technology professionals across seven categories. For the first time in the awards’ history, CEDIA announced a list of finalists a few weeks before CEDIA Expo to increase awareness and showcase the innovative work done by CEDIA members. This InnerSpace Electronics’ Orange County, NY whole-home project also earned them Gold honors in the 2015 Electronic House Home of the Year Awards this past June for the array of custom smart home technology solutions installed throughout the entire property. The InnerSpace team sets themselves apart from other custom integrators with their willingness to create truly custom programming solutions for each customer’s needs. To help these owners keep an eye on the massive property, InnerSpace installed 29 IC Realtime Cameras to monitor the 14,000 square-foot home itself, as well as the 142 acres of property surrounding it. The cameras’ motion sensors automatically signal the Savant automation system, which activates TVs inside the residence to display footage of the wildlife that roams the property, creating a “wildlife channel” for owners to view and playback later. The Savant home automation system also allows homeowners to control nearly every aspect of their commercial-grade lighting, heating, cooling and networking which unite with residential electronic door locks motorized shading and more. The owners can also control their completely hidden whole-home audio system with the touch of a button. InnerSpace was able to blend the Triad DesignerSeries speakers and Bowers & Wilkins subwoofers into the walls to keep a clean, consistent look throughout the home. InnerSpace Electronics’ elite home automation event yesterday provided attendees with a special first-look at the recently launched Savant App for iOS and Android devices. The event, held at the renowned NYC Savant Experience Center, InnerSpace, marked the first time that the Savant App was showcased in its entirety to the NY metro market. An architectural speaker system from B&W and Triad deliver audio goodness, while Lutron motorized shades provide clever ‘door’ solution. To its part-time NYC residents, this stunning penthouse offers a haven above the business and bustle of the streets of New York City. The pad boasts floor-to-ceiling windows with breathtaking views of Central Park West and the Manhattan skyline while flooding the apartment with natural light. This real estate left little to be desired—except for a reference-quality media room. Promises made – and kept- in a project with strict timelines. Taking second place in the $50,001-$100,000 Home Theater category is this impressive 28′ x 28′ theater. What’s so special is this theater is simple audio-phile and video-phile grade quality. A 52-by-52 foot space in this Westchester County, NY home afforded plenty of space for both home theater and game room. The game room offers high-tech digital gaming with a dedicated video screen, video game consoles and speakers. InnerSpace Electronics, Inc. Awarded Bronze in 2010 CEDIA Industry Professional Awards. InnerSpace Electronics transformed a newly purchased building in Brooklyn, NY into a mixed-use space for an avant-garde wallpaper company. Home Entertainment October 2009 High Style & High Tech A New York business exeutive brings home the look of a favorite golf club in the form of a clubby setting for his elite audiovisual toys. InnerSpace Electronics Received 2 Electronics Lifestyles Designer Awards from International Trade Association. Integrated Home $601,000-$801,000 Gold Medal, Large Home Theater $211,000-$290,000 Silver Medal. Prestige New York Fall 2009 Back to the Future One system integrates the whole house via e-control from any computer in the house or from a remote location via a VPN (Virtual Private Network). Form and Function Custom Installation Innerspace Electronics provides a ‘functional, but elegant’ home integration system that was just what the customer ordered. HSTA Adds New Member The Home Theater Specialists of America (HTSA) announced this week that Port Chester, N.Y.-based company Innerspace Electronics has joined the group. Innerspace is HTSA’s 63rd member. Some retro digs house today’s cool gear. InnerSpace Electronics was proud to annouce they were the winner of 3 Electronic Lifestyles Designer Awards. Integrated Home $150,000-$200,000 Technical Design, Integrated Home $230,000-$290,000 Technical Design and Best Technical Media Room Technical Design. Home technology installation is a billion-dollar industry, and it’s expected to continue to expand. Many of today’s home buyers are interested in structured wiring, home theaters and home automation. A survey of builders found that more than half offered electronics for home theaters and installed them in 46% of homes sold, according to Parks Associates, a leading market research and consulting firm that provides information and analysis on emerging technologies. With every passing month, more and more is made of our impending ecological crisis: global warming, CO2 emissions, the skyrocketing price of oil and what we can all do to help. InnerSpace Electronics was selected for an Electronic Lifestyles Designer Award for the design and installation of the best integrated home system between $450,000-$545,000. A Q&A with Andrea & Barry Reiner about their involvement with the Elf Foundation, a non-profit charity with the mission of creating private entertainment theaters for children’s hospitals, autism centers, shelters for abused kids, and hospices for terminally ill children. In Connecticut, a couple’s wish for a contemporary home on the water generated a year of remodeling, challenges by the truckload and, at the end of the project, well-earned satisfaction for everyone involved. A major multi-zone system and a Theo Kalomirakis home theater hide in a secluded New England location.